Supporters rally Oct. 10 at the Wood Street Station. Chicago Police Supt. Garry McCarthy will address concerns about the proposed 13th District consolidation at a 6:30 pm Tuesday community meeting in the Ukrainian Cultural Center. The Wood Street district would be merged next spring into a new 12th District station three miles away at 1412 S. Blue Island Ave., according to the Chicago Journal. Aldermen in 13th District wards have been invited to speak at a 5:30 pm rally before the town-hall meeting at the center, 2247 W. Chicago Ave. Rally organizers have launched a website at save13.org. Budget Director Alex Holt said closing the station would save $5 million, according to the 1st Ward newsletter  a "number so comparatively low," wrote Ald. Proco Joe Moreno, "that I continue to find it hard to justify these closures when the community has been so vocal about keeping the station open." 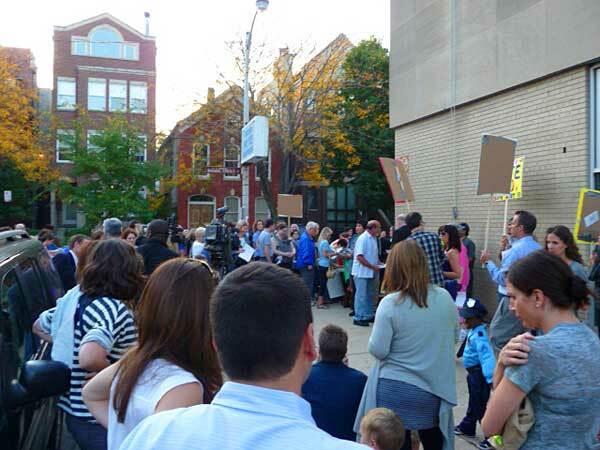 Moreno was the only alderman attending the Oct. 10 rally to save the building at 937 N. Wood. He and another station supporter, Ald. Scott Waguespack (32nd), are sponsoring the town hall meeting. Robert Fioretti (2nd) and Roberto Maldonado (26th) also support keeping the station open, said Tom Tomek, East Village Association CAPS liaison. "The aldermen each remarked that they received hundreds and thousands of correspondence from you the concerned citizens and business owners of the 13th District," Tomek said. Tomek suggested that supporters write Mayor Rahm Emanuel and contact district aldermen still on the fence: Walter Burnett Jr. (27th), Jason Ervin (28th) and Brendan Reilly (42nd). Public hearings continue through Nov. 2, leading to a Nov. 16 City Council vote.